This addon depends on the following libraries, which you need to download and install as standalone libraries in order to let this addon work properly! Due to errors in the saved data structures I had to reset the WishList SavedVariables! You will loose your settings and saved sets! 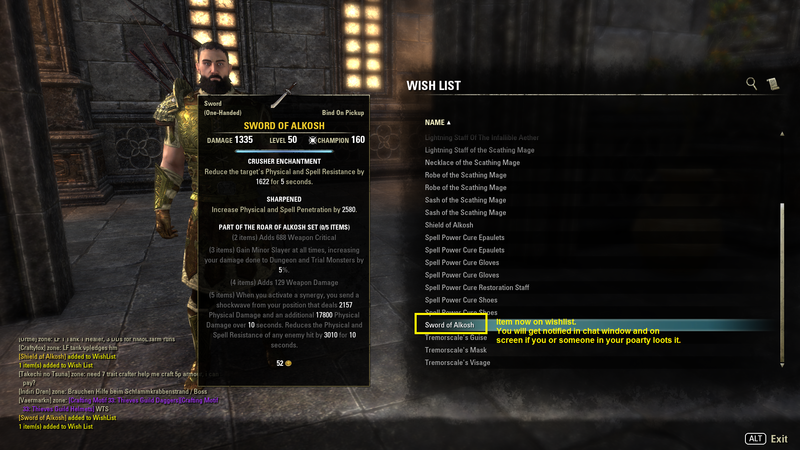 Please make a backup of your old WishList SavedVariables (Minion, or manually) and/or screenshots to re-add the items afterwards! Sorry for that but it's really needed as the items were always saved globally to the loged in character only. The only addon for all your gear farming needs. Wish List lets you add items to a "wish list". You can add items by set, item type, slot and trait. 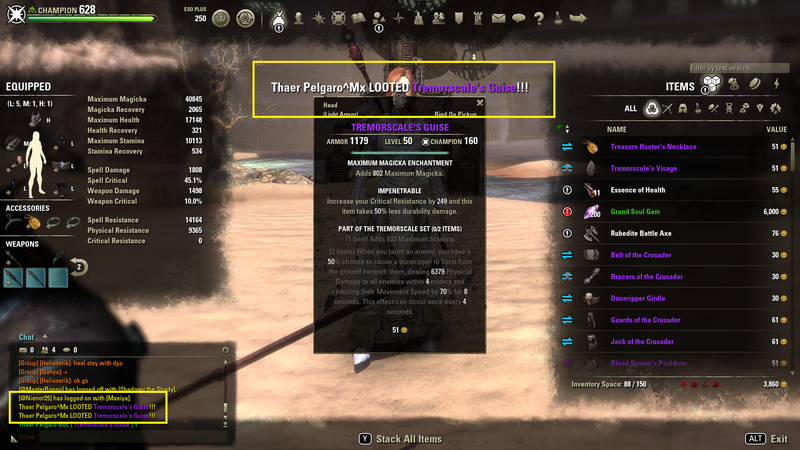 When you or someone else in your party loots that item, you get notified in the chat window and on screen. In order to let this happen please login each character with this addon enabled "once"! Wish List adds all set items, unique or not to your wish list. No more searching the internet for names of set items that are not obvious! For example, the Viper's Sting set has a few different necklaces and rings that are not called Ring of the Viper or Necklace of the Viper. If you add Viper set necklace to your wish list, this addon will add all known necklaces of that set, saving you the time and trouble of having to look it up. Open Wish List and be sure you are on the first tab "Sets"
Click the "Find sets" button & wait for it to finish (You only have to do this once and only on one character! If a game patch was applied you can repeat this via the "Reload sets" button, located at the top left corner of the "Sets search" tab, to scan for new set parts). When items are on your wish list, you will get notified in the chat window and on screen if the item has dropped, and who looted it. Unfortunately the SavedVariables needed a reset :( Sorry for that but it's really needed to fix some issues. Please BACKUP YOUR WishList.lua SavedVariables file if you need the old data, or make some screenshots of the items you want to re-add later on! -Tooltips for each row on the history tab, showing info about the date/time, location and username in full length. -Settings to show character name or account name (onlky works for the looted items from yourself, due to game API restrictions. Looted items of your group members will use their character name). If the addon is enabled you are able to choose one of the defined FCOItemSaver marker icons from a dropdown within the WishList settings menu. New looted items will be marked with this marker icon if you have enabled it in the WishList settingsmenu. No checks, if the item got already any other marker icon, will be done. The marker icon will be set, that's all! If you change the name, color etc. of any of the marker icons within the FCOItemSaver settings menu please do a /relodui in order to show the dropdown selection box within the WishList menu with the new changed entries! -The character dropdown boxes are sorted by the name now. The currently logged in character is shown with surrounding "-" signs: "- <name> -"
This might make your WishList entries which you have added in the past not show the armor or weapon info text anymore. -Prepared search methods for the WishList tab to be able to choose from "Search by name", "Search by set bonus, "Search by slot", "Search by trait". Currently only name and setbonus are working! -Added new button at the WishList tab to copy the wishlist of one char to another. A dialog will be shown where you can choose the char where the currently selected char's items should be copied to. -Added the possibility to "SHIFT" + right click an item in the chat to "force" the addon to show the "Add item to WishList" dialog, so you can add the item which is on your currently logged in char's wishlist also to another of your chars. 3. 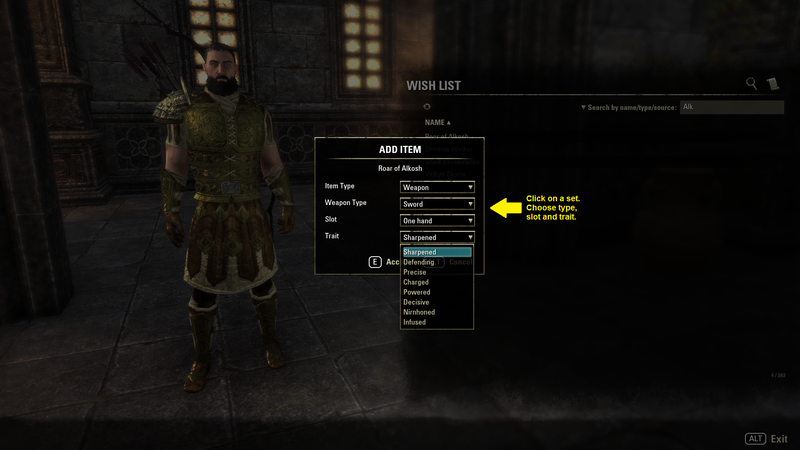 Preset the character at the "Add item to wishlist" dialog (Either your currently logged in char, or the one selected at the wishlist tab). -Add set parts for each of your characters/toons without being logged in with them! !! !You once need to login with each of your character/toon having the WishList addon enabled in order to collect some data and make this logged in char/toon visible within the WishList addon for all other chars/toons!!! And you are able to specify the character inside the "Add item" dialog (preselected is the currently logged in character). --Trait dropdown box got an "All traits" entry which allows you to specify if all available traits should be added (works combined with the new buttons, or for a single selected item via the "Add item" button). The dropdownboxes filter traits out so you do not see a "Halthy" trait for a weapon (as it only applies to jewelry which will be in the dropdown box if there is a healthy jewelry set party available. So if you do not change the dropdown boxes from weapons e.g. to jewelry there will only be shown the weapon traits available! If you then click the button to add all set items of the set, and have chosen the "Sharpened" trait, only sharpened weapons will be added. -> I need to find a way so you can specify the traits to add if you click the "Add whole set" button. -Added keybinding to add/remove items to/from your WishList by hovering the moues of the item in your inventory, character, bank, guildbanks, shops, guild stores. Chat will tell you if the item was added. if it was on your list already a popup dialog will ask if you want to remove it from your WishList. + Added functionality to add items linked to chat by right clicking and choosing "Add to Wish List"
And what exactly should this do to the character or account name posted to chat? What would this change to the described ZOs handling of links of charnames in chats? Are you able to trick the handling of the game this way? More explanation please, and maybe screenshots to show the difference. And please test this with both ways of posting, character name and account name (settings to change within the Wishlist LAM settings). Your text ONLY uses "character:" and no acocunt information so it would even write character if the user uses the account names, right? I checked it. It works. New version works perfectly. Thanks! Feature request: please, make a name of the user as link in the messages, so you can immediately whisper to him. Unfortunately the messages of the addon are shown in the chat's system channel and there is no way to allow player links in this channel type. If I'd "say" or "tell" the message everyone else would see it and thus this would annoy others, but the player link would work in there. Last edited by Baertram : 04/13/19 at 06:46 AM. Found the bugs and fixed them, thanks for telling me. Ok, seems the hrc trial is not recognized properly as a zonename then. Never was in there, will try to test it somehow to see if a zonename was found. Not sure though why the char name is not recognized properly then. Maybe another addon disturbing. Do you use any other group related addons, especially ones changing the character names or colors? How did you setup the addon to show the names, character or @account? In what zone or where did the item drop which is shown as location "blank" and username ??? I need something to rebuild the problem. The zone names are given by the API of the game so if this is missing you fond the item somewhere in a dungeon e.g. which's name was not returned by the game properly. I have it set to show character name, I will try with @account whenever I will have a chance. The 'Looted item message' is the standard one. Items were looted in HRC trial. I actually did not change any of the default setting, only added items to the wish list. Being honest, the localization is not that important for me, but the character name on the other hand is, as I am using your addon mostly to be informed when a party member loots an item from my Wish List. Really appreciate your help and time. Last edited by Baertram : 02/02/19 at 05:58 PM. Awesome addon, many thanks for creating it! Unfortunatly, in my case, in history, it only shows "???" under USER, and the tooltip have both the Locality and Name blank. I double checked and I have all Libs installed as well as updated version of the addon (via Minion). Also, on screen notifications do not show username, only ": name of the item". Any idea what maybe wrong with my setup? If I may suggest something, could you add vMA weaps to this list as well? I know MA isn't a group instance, but I think it could come in handy (e.g. in case someone doesn't pay attention to the drops). Most importantly, of all the group loot addons, yours is by far the most comprehensive - if it could function as an 'item directory' of sorts as well, that would be amazing!! I try to avoid having multiple addons that are similar, so although there are a few item search ones, I would love it if you could just add those drops to this one. I'm sure others would appreciate it too! Currently this is not planned as I'd have to add the itemIds of all the vMA weapons to a list and update it if the game changes the ids. It needs many time to maintain and just to get them for now as they are not listed as "set" ingame and there are no other API functions to easily determine them. Maybe in the future but I'm very busy with all the PTS changes and real life. WL is only a local variable within wishlist code. You must use the global variable Wishlist. And the ID in charData is NOT the name! You must use the api function to get the actually logged in charId, not sure what the name was again. Check the api txt file for something like GetCurrentCharacterId() or something like this. 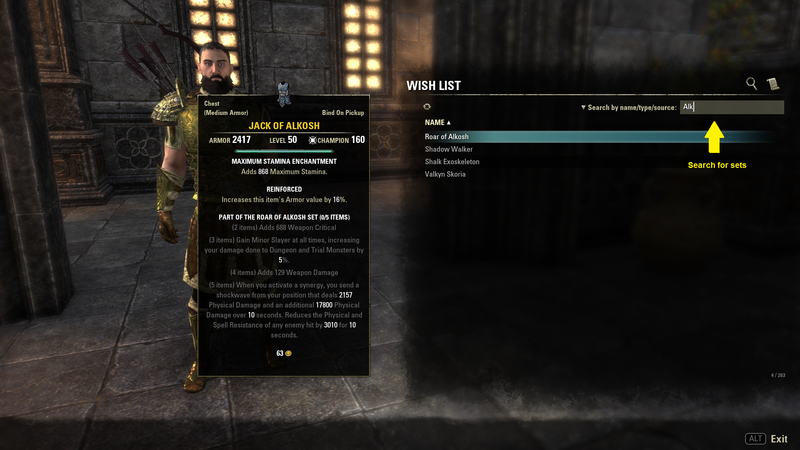 This will only check if the item is on the currently logged in character's WishList! Again thanks for this addon it's amazing! Last edited by Baertram : 01/26/19 at 03:09 PM. Last edited by Pandamine : 01/25/19 at 09:23 PM. Unfortunately the SavedVariables needed a reset Sorry for that but it's really needed to fix some issues. Please BACKUP YOUR WishList.lua SavedVariables file! Last edited by Baertram : 01/04/19 at 08:52 AM.